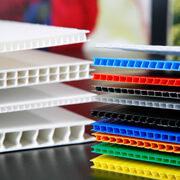 Corrugated plastic or corriboard – also known under the trade names of Polyflute, Coroplast, FlutePlast, IntePro, Proplex, Correx, Twinplast, Corriflute or Corflute – refers to a wide range of extruded twinwall plastic-sheet products produced from high-impact polypropylene resin with a similar make-up to corrugated fiberboard. It is a light-weight tough material which can easily be cut with a utility knife. Manufacturers typically offer a wide variety of colors and thicknesses (quite commonly 3, 4, 5 mm). Chemically, the sheet is inert, with a neutral PH factor. At regular temperatures most oils, solvents and water have no effect, allowing it to perform under adverse weather conditions or as a product component exposed to harsh chemicals. Standard sheets can be modified with additives, which are melt-blended into the sheet to meet specific needs of the end-user. Special products that require additives include: ultra-violet protection, anti-static, flame retardant, custom colors,corrosive inhibitors, static-dissipative, among others. This material is commonly used to erect commercial, political or other types of signs and for constructing plasticcontainers and reusable packaging. It is widely used in the sign-writing industry for making signs for real estate sales, construction sites and promotions. The last decade has found its increasing use among guinea pig, rabbit, domesticated hedgehog and other small pet enthusiasts as components of DIY cages. Additionally, it is used by members of the remote-controlled aircraft community to build nearly indestructible SPAD model aircraft.